1088 Budapest, Trefort u. 2. Museum Hotel Budapest is situated in the heart of Budapest, right next to the National Museum and close to several cultural attractions and tourist sights. The main shopping area Váci street, the St. Steven's Basilica, the Jewish Synagogue are just steps away from this fashionable place. Thank to the central location in the financial and business district, the most important offices are also easily accessible. Comfortable soundproofed and air-conditioned rooms provide for a peaceful night's rest. The hotel consists of 2 different parts (104 rooms) - a classical, Mediterranean-style one and a modernly styled building. It has 104 stylish, spacious, sound-proof rooms with air-conditioning, bathroom, phone, laptop-size safe, colour TV with satellite channels, Pay video-programmes, Internet on tv and laptop internet, WIFI, radio, hairdryer and minibar. There are 6 separate floors for non-smoking guests. Upper class Deluxe rooms in the newest and unique design are also available for your highest comfort. Standard buffet breakfast with Hungarian specialities. The Lobby Bar offers a wide range of drinks, cocktails and snacks. Fitness-centre with sauna, jacuzzi, Turkish bath and massages (free of charge, apart from the massages). Business corner for free of charge for the hotel guests. The hotel has 1 seminar room with a max. capacity of 30 people in theatre style. 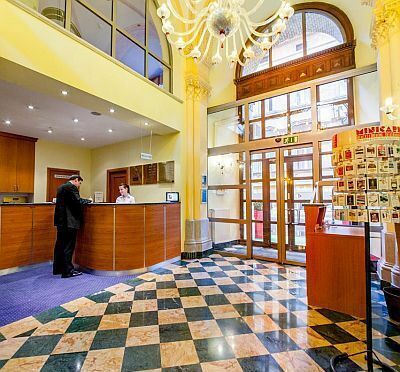 Mercure Budapest Museum offers free WiFi Internet connection in all public areas and guest rooms.